The Iowa eviction notice forms are forms that may be used in the event that a landlord seeks to remove a tenant from his or her rental property. The landlord must have a reason to remove the tenant, such as non-payment of rent, immediate danger to the property, noncompliance with the lease terms or because the landlord wants to terminate the lease according to its terms. In all cases, a landlord must properly inform the tenant by providing notice. The landlord also must give the tenant a certain amount of time to rectify the situation if the tenant has failed to pay rent or has otherwise breached the lease. If the tenant pays the full amount of rent owed or cures the breach, landlord may not proceed with eviction. However, if the tenant does not respond, landlord may proceed with the eviction, called a Forcible Entry and Detainer Action, in the local small claims court. Iowa has instituted electronic filing so, unless you receive an exemption, you will have to set up an account and make your Filing Electronically. 3-Day Notice to Quit (Non-Payment) – This form is used when a tenant has failed to pay rent. Landlord may give notice of the failure and must allow three days for the tenant to pay what is owed before commencing an eviction action. If the tenant pays the rent in full before the three day notice period has expired, landlord cannot continue to seek eviction. 3-Day Notice to Quit (Clear and Present Danger) – This form is used when the tenant has engaged in dangerous conduct that puts people and property at risk. Landlord will have to prove evidence of such conduct when seeking eviction. 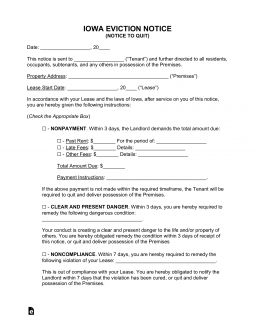 7-Day Notice to Quit (Non-Compliance) – This form is used when the tenant is in breach of the lease. Landlord must give the tenant seven days to fix the problem before commencing proceedings in court. 30-Day Notice to Quit (Month to Month) – This form is used when the landlord does not want to renew a month-to-month tenancy and wants the tenant to move out at the end of the month. Rent is late in Iowa when tenant fails to pay on the date it is due under the terms of the lease. Landlord must provide written notice that the rent is late and give the tenant three days to pay before continuing proceedings. Step 2 – If the tenant fails to respond satisfactorily to the written notice in the time allowed, the landlord may begin a forcible entry and detainer action in small claims court. In Iowa, the court system requires that small claims be filed electronically, so you will have to set up an account on This Webpage. You will then have to fill out this Forcible Entry and Detainer and file it electronically with the small claims court in your county. You will also need to file a confidential information sheet with the clerk. Step 3 – After you have filed the Forcible Entry and Detainer form, you will have to have it served on the tenant either by service of process, having it signed by an adult at the residence, or by posting and mailing by certified mail. Step 4 – The court will set a hearing date within eight (8) days of filing. You should have the evidence of serving the notice to quit as well as serving the forcible entry and detainer notice. The court will issue a decision either in favor of the landlord or tenant. If it is in favor of the landlord, the tenant shall have to vacate. If the tenant disagrees with the decision of the Judge, the tenant may file an appeal using Form 3.26. Obtain a copy of the Signed Lease for reference. When you are ready to proceed, download the “Iowa Notice to Quit” from this page using any of the file type buttons under the image. On the blank line, at the top of this page, fill in the Name of the Tenant or Subtenant this document is addressed to. In the first statement, report the City where the rental property is located on the first blank space. Then, report the County where the rental property is located on the second blank space and enter the Zip Code where the rental property is located on the third blank space. The Building Number and Street where the rental property is located must also be reported in the area following the words “number and street as.” Finally, if the rental property is defined by an Apartment Number, report this number using the last space in this statement. The next statement will only require the Signature Date reported on the Lease to be documented. You may enter the Signature Date by filling in the Calendar Day on the first blank line, the Month on the second blank line, and the Year the Signature occurred on the third blank line. The Nonpayment checkbox should be chosen if the Tenant has not paid his or her rent and must be warned of the repercussions. This statement will give the Tenant three days to pay this Overdue Rent or vacate the premises for the Landlord. The blank lines present in this statement will require the Name of an Authorized Agent, the Dollar Amount Owed, the Dollar Amount that must be paid, and the Time Period this Amount Owed relates to. The Noncompliance checkbox should be chosen if the Tenant has not remained compliant with the conditions stated in the Lease Agreement held with the Landlord. The blank line here requires the exact Lease terminology that has been violated by the Tenant. This statement informs the Tenant that he or she will need to affect a remedy to the violation immediately or vacate the premises for the Landlord. The Clear and Present Danger checkbox should be chosen if the Tenant is the source of a danger to the Property or other Tenants on the Rental Property. The blank line here will require a definition of the Dangers the Tenant poses. This statement informs the Tenant that he or she must vacate the rental property for the Landlord within three days. The first Month to Month Tenancy checkbox should be chosen if the Tenant must be informed the Month to Month Tenancy he or she is in will expire in (at least) thirty days from the Tenant’s receipt of this Notice. This statement will require the Expiration Date of the Month to Month Tenancy to be reported on the blank spaces provided. The second Month to Month Tenancy checkbox should be chosen if the Landlord must be informed of the Tenant’s intent to terminate the Month to Month Tenancy Agreement in (at least) thirty days from the Landlord’s receipt of this Notice. The exact date must be entered using the blank spaces in this statement. The paragraph bearing the words “You are further notified that…” will need to be verified with the Landlord’s Signature on the blank line provided. The Delivery of this document must occur in a timely manner and this must be provable. To provide some documentation to this fact the individual delivering this paperwork must document the Date of Delivery and the Recipient’s Identity in the statement immediately below the section titled “Certificate of Delivery.” Below this the Delivery Agent must check one of the three check boxes to indicate whether this Notice was delivered successfully to the intended recipient, left with a reliable second party such an of age family member or mailed via First Class Mail. The Agent will be required to Sign his or her Name on the blank line at the bottom of this page.